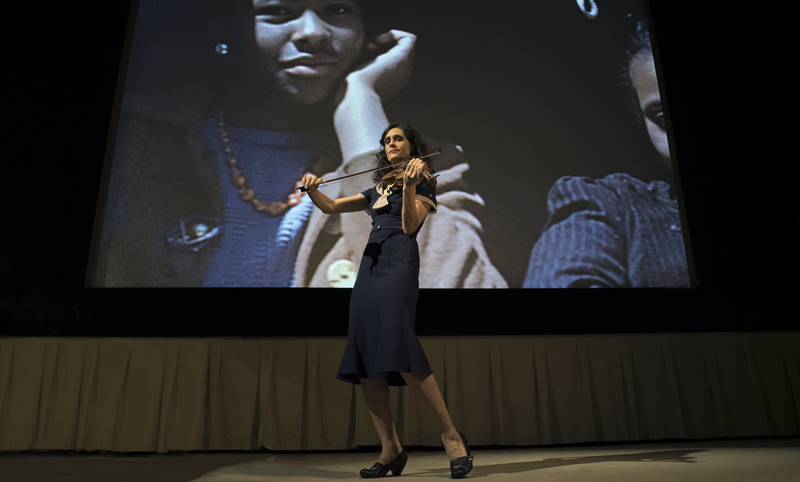 Jenny Scheinman’s Kannapolis: A Moving Portrait, which combines live folk music and historic film clips, will be presented on Wednesday, March 6 at 7:30 p.m. at the Campus Theatre, 413 Market Street, in downtown Lewisburg. In this new live music and film piece, acclaimed musician Jenny Scheinman presents the captivating visual world of H. Lee Waters, who documented more than 118 small towns in the southeast between 1936 and 1942. Waters’ films are of regular people going about their lives – mill workers streaming out of factories, a mother and daughter dancing on a dirt road, an old man reading a war-time headline and children racing in slow motion toward a huge wooden teeter totter. Scheinman and filmmaker Finn Taylor have re-edited these iconic images to Scheinman’s music, creating a new movie that speaks to any community as much as to the towns where it was filmed. 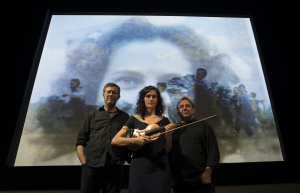 The ensemble is made up of: Jenny Scheinman – composer, arranger, violin, vocals, Robbie Fulks – guitar, banjo, vocals, Robbie Gjersoe – resonator guitar, baritone electric guitar, vocals, Finn Taylor – film director, Rick LeCompte – film editor and Trevor Jolly – sound designer. Kannapolis: A Moving Portrait was commissioned by Duke Performances at Duke University. Jenny Scheinman, lead artist, is a composer, violinist and songwriter. She grew up on a homestead in Northern California and has been performing since she was a teenager. Scheinman has released nine studio albums and continues to steadily develop her career and acclaim as a bandleader. In 2008 she received national press attention in such distinguished publications as Rolling Stone, Billboard, Wall Street Journal, New York Times for her simultaneous release of the lush orchestral instrumental album Crossing The Field and her debut eponymous vocal release Jenny Scheinman. She followed this with three critically acclaimed and strikingly contrasting releases – Mischief & Mayhem, The Littlest Prisoner (a stunning follow-up vocal release featuring Bill Frisell and Brian Blade) and Here On Earth (a tribute to fiddle music and a companion piece to her multi-media touring show Kannapolis: A Moving Portrait.) She consistently tops the Downbeat Magazine Critics Poll, and was hailed “best fiddler in NYC” by Time Out New York. General admission tickets are $20 for adults, $16 for seniors 62+, $10 for youth 18 and under, $10 for Bucknell employees and retirees (limit 2), FREE for Bucknell students (limit 2), and $10 for non-Bucknell college students (limit 2). Tickets can be purchased online at Bucknell.edu/BoxOffice or by calling 570-577-1000.